Hey everybody, Josh here with something that I'm excited to show you all. I built the collection to provide a comprehensive set of tokens for anyone playing competitive Vintage. If the project is able to hit its Stretch Goals, the Collections will increased to 54 cards. I was planning on adding 2 Pack Rat Tokens and 3 Squid Tokens, but that still leaves one slot undecided. Take a look at the project, join the Thunderclap if you really like it, and let me know what you think the last Stretch Goal token in the Vintage collection should be. This looks awesome and I'll donate on the kickstarter once it's live. One suggestion: can you make a cube collection? As far as the vintage collection, is the 1/1 robot supposed to be a myr? If not battleball and genesis chamber see some play. Also if you're willing to add more pieces, a Dack ultimate would be cool. I considered making a Cube collection and a EDH / Commander set as well. The only problem was figuring what tokens and how many to include as literally any token in any amount could be needed depending on the cube / deck. There is an option for a Full Set which will get you one of each token as well as package deals and add ons to customize your reward as needed. Some changes had to be made in naming the tokens for copyright purposes. 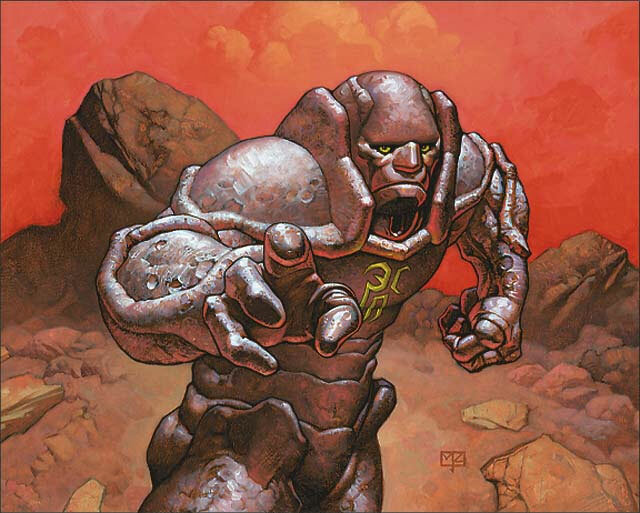 Robots are generic, Myr are WotC IP. There may be some wiggle room if you really wanted to push it, but it wasn't worth the risk. I definitely considered adding Emblem "tokens" but don't have one planned as of yet. LOVE this. Holla when it's live. super curious to know how copyright works on these. My (very basic) understanding was that you could take a picture and be free and clear to make reproductions, but if you are using an image someone else created that would infringe on their work. Were you able to obtain open source/licensed copies/make your own original images, or are you banking on the source material being out of copyright? I considered making a Cube collection and a EDH / Commander set as well. The only problem was figuring what tokens and how many to include as literally any token in any amount could be needed depending on the cube / deck. Fair enough. However I expect a large percentage of cubes whose owners are willing to shell out money on these tokens for are "good stuff" cubes whose token requirements are close to identical. One could look at the average cubes on cubetutor if interested: http://www.cubetutor.com/averagecubes in fact I'd propose a list if you are interested. So, for most countries, the copyright owned by the artist expires 70 years after their death, then entering the public domain. So if you were able to take a picture of it, or make a copy, after that date, there is no copyright preventing you from selling it etc. Now once you start talking about using photos and digital images of artwork in the public domain, things get complicated. In some countries, there is no copyright granted for a reproductive photograph, in some cases there are limited copyrights, some grant full. So you are correct that in some cases, in some countries, you would indeed be infringing on their photo. I may not agree with that concept, but such is life. For this project I ensured that each image is obtained from either a license free, attribution required or licensed (for a small fee) source. It took a few iterations of selecting usable images and several pieces that I want to use are off limits, but the project is good to go. I'd propose a list if you are interested. I don't know if I would be able to include it in this project, but I would be very interested in seeing what you think should go into a Cube Token list. I changed it to Ms. Lage to be a bit more fitting. I can't use any proper names from the game unless I want to risk infringing copyright. 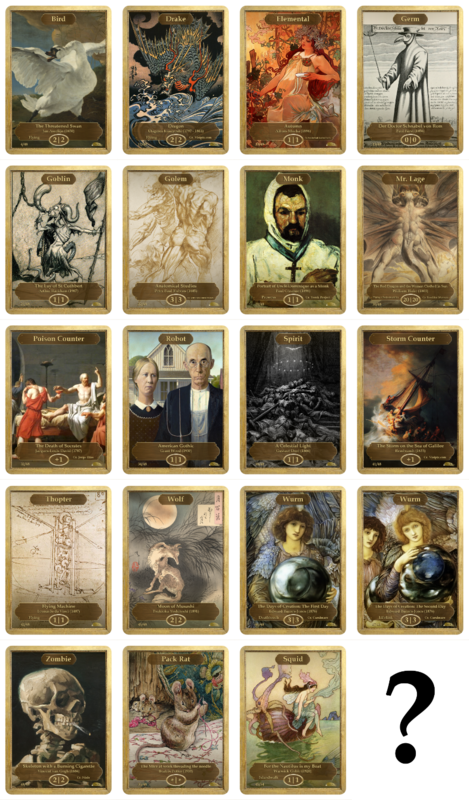 The Classic Art Token Kickstarter is well under way. On track to hit 400% funding in under 12 hours. Outstanding is not a good enough word to describe my current reaction. 5 Stretch Goals have already been hit and we are just about to hit #6 and unlock two more Playmat designs. Congrats on the whole thing, Josh. This turned out beautifully. I look forward to getting my Vintage tokens! The Kickstarter hit a big milestone today, breaking above $50,000 inside the first week since launch. I am in talks with Cascade to secure a (small) booth at the event and look forward to meeting anyone that can make it out there for the show. I'll be selling mats and tokens and likely try and run/sponsor a few special events as well. I am so excited to be here already and I hope we can get to the next set of Stretch Goals soon. I have even more great things lined up and it will be amazing once we get there. It looks like we are on track to hit the Stretch Goal that will grow the Token Collections from 54 cards to 72. If anyone was on the fence about this, there is about 83 minutes left to back this. Thanks for the bump H.
1,848 Backers and $108,858 in funding. Outstanding! Thanks to everyone for the support and feedback!